*A generic term for surfcraft, of various design, usually ridden prone or kneeling. A traditional Hawai'ian term is kioe (small surfboard) and general descriptions include the Handboard, Bellyboard, and Kneeboard. Specific designs include the Paipo, Lamaroo, Empire board, Surf-o-plane, Coolite, Surf-Mat, Boogie, Spoon, Slab, etc. 1930 Solid Wood Belly Board 4ft 5 1/2"
1930 Solid Wood Belly Board 4ft 3 "
1956 Bellyboard, Balsa 3ft 8"
1963 Bill Wallace, Kneeboard 5ft 3"
1966 Bay Area Belly/Knee Board 5 ft 5"
1970 The Shoe by Shane. Spoon decked Knee Board 4 ft 11"
1973Jackson, Greenough Spoon 5 ft 10"
1973 Barry Taylor, Flextail Kneeboard 5 ft 6"
1978 Sky Kneeboard 5 ft 8 1/2"
1978 Friar Tuck Twin-fin Slab Kneeboard 5 ft 6.5"
George Greenough Design Kneeboard 5 ft 6 1/2"
Before bodyboards there was plywood. Paipo rider Sean Ross, Pipeline, Hawaii. Coolite, Kneeboard, Spoon, Slab, Mat, Boogie board. There is apparently no use of the term "paipo" before about 1950 and it does not appear to be firmly established until the early 1960s, about the time the specific wide tailed designs illustrated above were developed. It does not appear to be a traditional Hawaiian surboard term and critically, it is not included in the Appendix of Hawaiian Surfing Terms of Dr. Ben Finney's groundbreaking The Ancient Sport of Surfing (1966, pages 94-96 in the 1996 edition). Nor is paipo mentioned in the body of the text, with the term bodyboard preferred. Pukui, Mary Kawena and Elbert, Samuel H.: Hawaiian Dictionary: Hawaiian-English, English-Hawaiian. University of Hawaii Press, Honolulu, 1986. 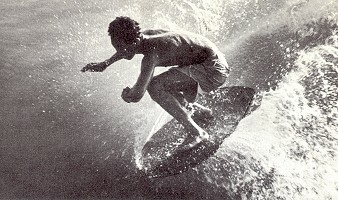 Paipo appears in print in a number of surfing books published in 1965 by Farrelly, Dixon, Severson, Klein and John Kelly's excellent Surf and Sea (1965). There is no entry for bellyboard. "paipo: A small surfboard from approximately one to three feet long held in front with the hands or beneath the chest; a belly board. Some riders can stand on paipo boards. The term is from popular usage but may stem from pae, to ride a wave to shore, and pu, the sea at midtide (Hawaiian)." Kelly: Surf and Sea (1965) page 290. Kelly's claim that "Some riders can stand on paipo boards" is confrirmed by a photograph by Val Valentine, facing page 192. 2. vi. To land, disembark, come ashore; to mount or catch a wave, as of a surf rider; washed or drifted ashore. ... Pae i ka nalu, to ride a wave into the shore." (page 298). 11. ... Kai pu, a sea without animation, sea at midtide." 6. n. canoe end-piece, both for and aft." (page 344). It is difficult to see how this transcription of pu as "the sea at midtide" is an applicable to a prone board. Perhaps the sixth definition, the fore or end piece of a canoe, is more relevant. The earliest European report of surf riding by Banks (1769) is on "the stern of an old canoe." In the Ellice Islands, there are two methods of te seke (surf riding) - faka-tua-fonu (body surfing) or using the puke. The puke is the, often used, bow-covering of a canoe, and the same name is applied to any board so used for surf riding. - Kennedy, Donald Gilbert: Field Notes on the Culture of Vaitupu, Ellice Islands. The Journal of Polynesian Society , Volume 39 Number 1, No. 153, March 1930, page 111. In a report of surfboard riding in Somoa in 1866, W. T. Pritchard noted that, alternatively. they would "take to their paopao, or little canoes, and pass the rest of the morning in them at the same sport." - Pritchard, W. T.: Polynesian Reminiscences, Chapman and Hall, London, 1866, page 186. Similarly, but far less likely, the term "pa ipu" (the a has an overmark) meaning "Calabash, wooden dish in general cooking utensil, bowl" [Puki: Hawaiian Dictionary (1986) page 303], also could have been adpted to describe the dished nose design. Kelly makes special mention of the wide-tailed dished nose design, however he identifies it as a "Skim or skitter board". This is not to be confused with the 1960s Skimboard, a flat plywood, often circular, board that is not (normally) a wave riding craft. "A fast finless belly or paipo board about board 42 inches long and 30 inches wide and around three-eighths of an inch thick with a flat bottom-one of the fastest wave-riding devices." Kelly: Surf and Sea (1965) pages 293-294. The design is detailed and illustrated on pages 62 to 64, with the Skim board design accredited to John Waidelich and Jim Growney (see Appendix A). 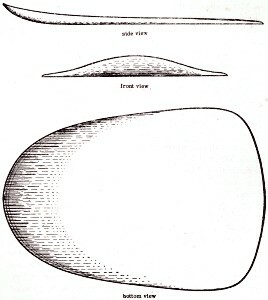 Skim board; side, front, and bottom views. length 42", width 30'" thickness 3/8", bow scoop 3". belly board at Kuhio pier, Waikiki. Not a "Skim board", as described by Kelly. At this point (June 2009), one early commercial use of the term is a decal for a prone timber board, possibly produced between 1935 and 1955. The image was listed at stanleys surfcrazy logo library and is reproduced with permission, right. John Clark, whom you probably know of, has written several books on Hawaii and is working on a book on Hawaiian surf traditions. "Wally made his first Hawaiian Pai Po Board in December 1955, but he didn't like the way it rode. The decal was used only on his paipo boards, not on his surfboards." I believe John has a copy of this patent and is in contact with Wally. He also has done some interesting research into the origins of the term paipo. See below for original email correspondence, Appendix B. Presumably, the central red rectangle was intended to include a individual serial number, although it is not evident in this example. Froiseth was probably Wally Froiseth, born in Los Angles in 1919 and who moved to Honolulu in 1925. He began surfing at age eight and was active as a surfer, contest diector and judge until the1970s- a forty year surfing career. The brief biographical notes (see Appendix C, below) are mainly based on Wally Froiseth's entry in Matt Warshaw's essential Surfing Encyclopedia and, needless to say, there is no mention of the decal or board under discussion. With such an extensive resume and out specific contemporary documentation or first person annecdotes, it is impossible to suggest a date for the Froiseth decal. It could easily be anywhere between 1937 and 1970. At a guess 1956 (???). Note that John Kelly (quoted above) and Wally Froiseth were close surfing compatriots. In 1936-1937, Froiseth, Kelly and Fran Heath developed the tapered-tailed Hot Curl design, setting the precedent for the templates of Gun or Speed boards for the next 50 years. Surfer Magazine Vol 30 No. 10 1989, pages 104 - 105. He used a moulding surface to shape the bottom of the board. This was formed in earth outside his house, and lined with cement mortar. He laid vaneers (sic) of timber in this with glue between, then pressed the whole thing with sandbags on top. When the glue had set, he trimmed and finished the board. Concave tails to boards were all the rage that season, and Val was spending much of his time trying to build a concave Paipo that would work. I could see that this was not working out at all, and returned to Australia with one of his regular (non concave) Paipo boards." -emailed by Jamie Farfor 16 February 2005. By implication, these boards undoubtedly carried some type of identification including the word Paipo. "... I built a press that had a concrete base mould at table height, and was loaded with a hydraulic powered airbag. Looking back on it, I was lucky that the thing never exploded. I started using timber vaneer, but was unable to get suitable quality of material. that I could form the two way curve (shallow dome) at the nose of the board. By putting plastic sheet between, I was able to form 3 boards in the press at a time. With the stresses in the plywood, the curvature at the nose was less than with the timber vaneer." Using this method, Farfor was able to produce a professional quality board, in some cases with a attractive fabric-laminated bottom. 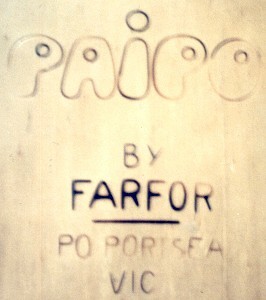 The boards were branded with : " Paipo by Farfor PO Box Portsea Vic ". Paipo board by Jamie Farfor. 3ft 5'' x 29 1/2". Varnished plywood with branded decal and fabric laminated bottom. Branded Paipo by Farfor decal. Sydney Surf Auction, September 2003. .In the early 1960s prone and knee boards had a strong market- suitable for juvenile riders and easily transported, they were considered superior to the universally available surfoplane. When ridden by experienced surfers, usually with swim fins, they could achieve high performance wave riding. The short length and stability allowed critical takeoffs and ride deep in the curl. For this reson, they were particually suited to steep fast breaking waves such as Sandy Beach on Ohau and the Wedge in California. Importantly, before the adoption of the legrope circa 1974, prone or knee boarders, by virtue of their proximity to the board, have more control during wipe outs, enabling them to ride deeper in the wave with confidence. Thus, for a period, they dominated at rock-strewn breaks were wipeouts were potentially board destroying, for example Little Avalon, Sydney. In the later 1960s in California, Paipo was used by several companies specializing in various prone and kneeboard designs, the advertisements often featuring easy transportation with the rider on a push or motor bike. Several Californian companies located themselves at Newport Beach, home of the famous Newport Wedge, such as Newport Paipo Boards (Box 5685, Santa Monica. Ca., 90405) which began around 1967 and by the mid-seventies had produced several models such as the Stub Vector, the Wedge Vector, the Concave Vector, the Shoe and the Knee Vector. The boards often featured a hollowed deck, visually similar to the groundbreaking designs by George Greenough, and sometimes handgrips. 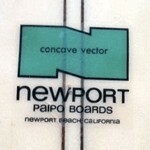 Also at Newport was El Paipo Kneeboards (Costa Mesa, California) and Hawaiian Paipo Boards. 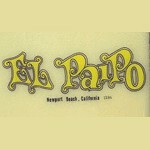 From Huntington Beach came the House of Paipo and Jack's Surfboards marketed Jack's Huntington Paipo. Images courtesy of stanleys surfcrazy logo library. Surfers riding conventional boards not only have to contend with slower bodysurfers nowadays, but with faster belly board riders as well. A new belly board that skims the surface has put in its appearance, first in Hawaii and now spreading to other parts of the world. Developed and perfected by John Waidelich and Jim Growney, it has speed capabilities in excess of the fastest gun surfboard. Until the recent development of the hydroplane surfboard which shares some of the features of the new skim boards, no surfboard rider could keep up with them. The skim board is very simple in design having a perfectly flat planing surface with sharp breakaway trailing edges. It has no skeg. The size of the skim board is important in relation to the weight of the rider that its lift surface must support. Average dimensions are approximately 3 1/2 to 4 feet in length. The aft end is usually less than 3 feet wide, and it tapers somewhat to a narrower front end which is cambered to prevent digging. Most of them are made of 3/8 inch plywood, surfaced with the usual fiber-glass and resin. The curved front edge may have an elevated rim for gripping. The riding technique consist of railing the extended aft side-edge of the skim board into the wall for the beginning of the fast slide. This enables ascent to a high position for the drop. On the drop, the board'is levelled with the water and tucked beneath the rider's chest, his head and shoulders extending over the front end and legs over the back end but not touching the water. The arm on the side of the slide (left arm on a left slide) extends forward to get it out of the way of any water coming over the side. The board then assumes a highly efficient planing position and achieves great speed. On large waves, say twelve to fifteen feet or more, the skim board riders skid down the slopes hitting only the high spots, board and rider being airborne for a good part of the time. Without a skeg and drag produced by side pressure thereon, the skim board follows more closely the path of its own inertial flight and thus achieves the highest speed thus far of any wave-riding device." Kelly: Surf and Sea (1965) pages 62-64. Noticed this decal listed as one of the earliest paipo decals. Do you have an approximate date or what type of board it was on? 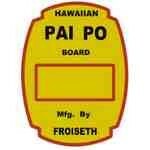 OK if I add this (with suitable accreditation to stanleys.com) to my web page entry for Paipo boards? "Hi Geoff, sorry for delay, of course you may use image. The board was most certainly wood (LA Ladder Co.?). George Froiseth was surf pioneer around LA, You probably know that, constantly in newspapers in 30's 40's as he promoted sales of beach property for realtors. Theres a lifesize bronze statue of him at Redondo Beach." In 1936-1937, Froiseth with John Kelly and Fran Heath, developed the tapered-tailed Hot Curl design, setting the precedent for the templates of Gun or Speed boards for the next 50 years. The ultimate testing ground for the Hot Curls was Makhaka Beach, although the crew did make some attempts at riding the powerful breaks of the North Shore. Froiseth and his step-son, George Downing, were the first to ride Lankiakea (1946) and Maui's Honolula Bay (1947), before testing the Hot Curl's in Southern California during 1948 . He won the prestigious Makaha contest in 1959 (aged 39) and next year became the contest director until it ceased in 1971. He was a respected and valued judge at wide range of surfing contests. "...Froiseth built, sailed, and paddled all manner of canoes and catamarans." Warshaw: Encyclopedia (2004) page 216. Newport Paipo Boards Advertisment, 1976. Extracts from Surfer 1976 June/July Volume 17 Number 2 page 133. Newport Paipo was conceived nearly a decade ago (circa 1967) to explore new avenues of wave involvement. The testing began at the Wedge. It had the energy and power needed to test our bellyboard and Paipo Board theories. This experrmentation fed to the first commercially built Paipo and bellyboards in the surfing industry in the late 60's. The Stub Vector, the Wedge Vector and the Concave Vector were air vehicles built and ridden during this trme. We began working with kneeboards -in the late 60'5. Our experimenting resulted in a radIcal two-in-one board called the Shoe. It was designed to be ridden like a kneeboard or a surfboard, depending upon your wave position. Our past ideas have evolved into a classic kneeboard design called the Knee Vector. It's built especially for kneeboarding by people who have been involved in finding new approaches to wave involvement for ten years. The Knee Vector is the culmination of those years of experience. All Newport Paipo Boards have countersunk leash attachments, use the Single box FU fin system, are constructed of Clark Foam, and are available up to 5' 6 " in length. Often denegrated, usually ignored, prone surfboards play an integral part in surfboard design and riding performance. 1. The art of Hawaiian surfriding as evidenced by Captain Cook in 1769 must have developed in the Pacific islands over centuries. Obviously the initial ventures would have been on small boards in small surf, close to shore. Only with a vast increase in skill and experience over a long time and the availability of suitable materials (for example wili wili, an Hawaiian equivalent of balsa wood) would stand up surfing be possible. 2. Most surfers begin their surfing on prone boards - for example Mark Richards on a Surf-o-plane and Tom Carroll on a Coolite. 3. Many surfboard design features have either been initially developed or taken to their extremes by non-standup surfers, for example George Greenough. 4. In many cases, performance levels have been set by prone/kneel boards. This was partically the case up to 1974, before the introduction of the legrope. Prone or knee boarders, by virtue of their proximity, have more control of the board during wipe outs and this enabled them to ride deeper in the wave with confidence and to dominate at breaks were wipeouts were board destroying, for example Little Avalon, Sydney. 5. Subsequent to the general adoption of the legrope, prone craft still establish some performance levels. Photographic evidence appears to confirm that Boogie riders ride deer and longer in the tube. 6. In other performance areas, such as "getting air", the manourves were established by Boogie riders ten years before being adapted by standup surfers. Geoff Cater (1999 - 2018) : Paipo Catalogue (Images). Joseph Banks and James Cook observe body and prone board surfing on the west coast of Tahiti. James King and David Samwell report prone board surfing by both genders in the Hawaiian Islands. William Bligh and James Morrison report prone surfing in Tahiti in extreme swell conditions. Morrison also provides the first account of standup surfing and identifies Iddeah, the wife of a local chief, as the most skilled. Captain Raine observes descendants of Bounty mutineers riding prone boards with “a ridge like a keel” on the bottom at Pitcairn Island. Illustrations of Hawaiian surfing show a variety of riding positions including prone, sitting, kneeling, drop-knee and standing. Percy Smith notes the use of prone boards by New Zealand’s Maoris. Prone boards first used in England. Small hand boards in use at Manly Beach, Australia. After visiting Hawaii, Jackson and Goldie ride prone boards at Point Lonsdale, Victoria, and introduce local girl Grace Smith-Wooton to the art. Production prone boards built by Risby Bros. in Tasmania. Square nosed timber boards with parallel rails, later known as Lamaroos (or Looma-Roo), used in Victoria. The design is also common in New Zealand, South Africa and UK. 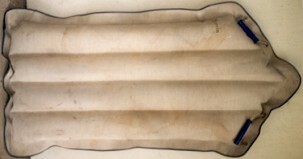 Dr. Ernest introduces his inflated rubber mat, the Surfoplane, in Australia. Ronald Funnell extols the virtues and dangers of prone surf-riding on narrow solid wood boards to English readers in The Art of Surf-riding. Plans for a solid wood bellyboard published in Popular Mechanics magazine. Plans for a laminated redwood-pine prone board printed in Popular Science magazine. Owen Churchill's molded rubber swim-fin design adopted by the US Navy and issued to their Underwater Demolition Teams in the early 1940s. Vernont Bartlet’s You and Your Surfboard, an introduction to prone board surfing, published in Great Britain. Curved prone boards in ash or chestnut and the Solarbo, an “extra buoyant flat” balsa board, available in Newquay, England. Wally Froiseth builds his first Hawaiian Pai Po Board, re-designed in early 1956 and followed by a patent application on May 9, 1956. In Sydney, Leigh Tingle has a twin fin fibreglassed bellyboard built from balsa off-cuts. George Greenough builds his first balsa wood kneeboard. Originally with a conventional D fin, the following year he replaces it with his first flexible high-aspect ratio fin. Bellyboards and kneeboards manufactured in foam and fibreglass. Jamie Farfor observes Val Valentine building the dished-nose Paipo boards with a wide-tailed plectrum-like template in Hawaii. Farfor purchases one of Valentine’s boards and, on returning to Australia, manufactures his own model. George Greenough builds his first balsa wood kneeboard with spooned deck, initially with twin fins. Greenough builds his first flexible Spoon and makes his first visit to Australia. Val Valentine commercially produces Paipo Nui boards. “Still others like a short bellyboard (sic) and a long ride like George Greenough at Santa Barbara, California” – Bruce Brown in the introduction to his The Endless Summer. Converse (USA) release their rubberised canvas Hodgman model surfmat. San Diego’s Steve Lis builds his first split-tail twin fin Fish kneeboard. The Coolite, a molded polystyrene foam board, and the hollow molded plastic Zippyboard introduced in Australia. Barracuda Bellyboards - a twin fin plywood board designed by Sydney’s Leigh Tingle. “Far-Out flexible Surfboard - the wave of the future?” article on Greenough’s Spoon printed in Popular Science magazine. Peter Crawford shapes his first Slab (the name is credited to Midget Farrelly), a wide bodied kneeboard at Wallace Surfboards as an alternative to the low floatation Greenough Spoon. George Greenough releases The Innermost Limits of Pure Fun. Shane Surfboards (Australia) produce a foam kneeboard with a Greenough influenced spooned deck, known as The Shoe. George Greenough releases his short film on mat surfing, Rubber Duck Riders. Tom Morey’s Boogie Board released, originally offered as a buyer assembled mail order product. Bahne screw and pin fin box introduced and becomes a standard feature on most kneeboards. Adoption of the legrope (or surf-leash) sees standup surfers begin to appear at extreme reef breaks, previously considered the domain of belly and knee boarders. The Bellybooger, a molded plastic twin fin bellyboard with spooned deck, marketed in Australia. 'Bout a Spoonful article by Bob McTavish, eight easy steps to building a Greenough Spoon, printed in Surfing World magazine. Boogie rider Mike Stewart profiled in Surfer magazine. Endangered Species, an article on kneeboarding, published in the Surfer’s Journal.